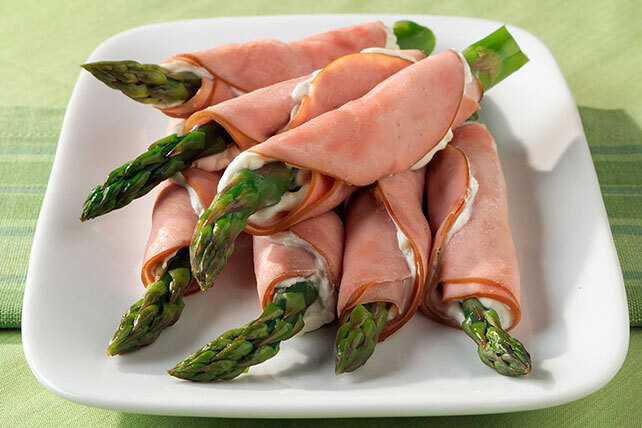 Try our Healthy Living Asparagus Rolls as an appetizer next time you entertain. Our Asparagus Rolls are delicious, easy to make and will please a crowd. Flatten ham slices; pat dry. Stack in piles of 2 slices each; spread each stack with 1 tsp. reduced-fat cream cheese. Place 1 aparagus spear on 1 long side of each ham stack; roll up. Place, seam-sides down, in 13x9-inch baking dish. Substitute frozen asparagus spears, cooked as directed on package, or canned asparagus spears, heated if desired, for the fresh asparagus. Assemble roll-ups as directed. Serve immediately. Or, cover and refrigerate until ready to serve. Assemble roll-ups as directed. Refrigerate up to 24 hours before baking as directed. Prepare as directed, using 1 pkg. (6 oz.) OSCAR MAYER Thin Sliced Smoked Ham. Substitute 1 slice of ham for every 2 slices of the shaved ham.